A stunning tribute to the English servicemen who fought and gave their lives in the Great War. 'They shall not grow old' honors all those who should never be forgotten. A must see for anyone who values the lessons of history. Real people in real story. Shows you the hellish life experience this was in matter of fact presentation. Stay for the trailer on how the movie was created. Visually stunning and emotionally draining. All middle and high school children should watch this movie. Remeberance Day has a more pronounced meaning for our family now. OUTSTANDING, What a experience, especially in 3D. The directors explanation of how they made this movie was also educational. Putting the sound track in by using lip readers etc showed the care they had in putting this together. A documentary, to be sure, but unlike any I've ever seen in capturing the reality of the Great War. A brilliantly executed project. Fantastic - the amount of intricate work required to create this film must have been enormous. Hopefully Hollywood will take note of the success of this film. After 100 years it is shocking the anniversary of WW1 went by with less attention than Groundhog's day. This film is well done and thankfully did not move at a stupid rapid pace simply to meet the needs of people with no attention span. I don't wish to include spoilers but recommend this film-especially to young people between 10 to 15 years of age. I had a great uncle over there who was gassed. Wish I could ask him now what it was like for him. Definitely stay after the credits. I became intrigued the moment I began reading of the various processes involved in producing this documentary. I had seen vintage black and white photography colourized but never moving pictures. The result is amazing, especially when coupled with synchronizing the film to a modern speed. Forensic lip readers also provide clues to actual dialogue. Mr. Jackson and his crew deserve a great deal of credit for bringing century old clips to stunning life! Should be compulsory for History class. Amazing ! Restoration, soundtrack so well thought out. Stay for the next 30 minutes to see what went into this documentary. Pull up your ancestry!! So proud I did. This is fascinating. The care that went into restoring the film and creating the soundtrack is one of the finest pieces of film work I have ever seen. Some of the images are just haunting. This movie should be mandatory viewing for every school child. amazing! we need to acknowledge what happened and never forget. I went to see the non 3D movie it’s so good I plan to go back to see The 3D movie this week. This film was the best film I have ever seen and I cannot wait to see it again. It was visceral, engaging, and honest. Very impressive film . The colorization process really brings the footage to life in very graphic detail . It's uncomfortable to watch some of the footage but , the veterans of ww1 lived through those terrible times of war .The least we can do is witness it and honor them . Very graphic. A great compilation. As a boy I know an oldtimer veteran of WWI ..and he told me how very horrible it was. 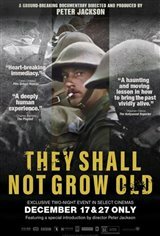 This film used awesome colorising and all narration was of original voices recorded and some actually on the front lines in Flanders fields " where the poppies grow". Great film. Historically reverent, respectful and authentic. A Herculean effort to put together. I am blown away at this incredible movie! This is what the world has been waiting for...a comprehensive historical review of the war that was suppose to “end all wars”!! I saw it in Charleston two weeks ago and even my daughter in law loved it...it is in color and it’s amazing!!! It was incredibly well done and while they didn't have sound back then had you not realized it when you watched the movie you wouldn't have known that it wasn't authentic. I find it interesting that someone would "rate" a movie that they haven't seen. It is being shown at different times in different areas. If you see it, do yourself a favor and stay till the bitter end. It's too late now for Island 16, but hopefully this movie shall be shown elsewhere. It was truly remarkable. A simple google search reveals they used forensic lip readers to determine what the soldiers were saying and then hired voice actors from the particular regiment's region to voice the words over the authentic footage. It further adds to the life that is given to the film by the frame rate adjustments and colorization. They didn't have sound in the films back then, so I tend to doubt the authenticity of the movie.